Several musical instruments in the past centuries were decorated with engravings, inlays, or paintings. This paper focuses on an integrated approach to detect and characterize the kind of dyes when used for the decorations. The multi analytical campaign was performed on a viol made by Joannes Marcus in the second half of the 16th century. The instrument has been shattered during World War II, and the fragments are now held in Conservatorio Giuseppe Verdi in Milan; they still conserve the original black and white purflings and the painted decorations. The study is of critical importance since Joannes Marcus worked in the sixteenth century and, in this very period, some executive features were introduced in musical instrument making, which are now veritable standards for this kind of instruments. At first, UV fluorescence examination and reflectographic analysis have been performed on the different fragments in order to characterize, respectively, the distribution of varnishes and glues on the surface and to select the areas treated with metal-gall inks that result transparent by long wave IR reflectographic technique. 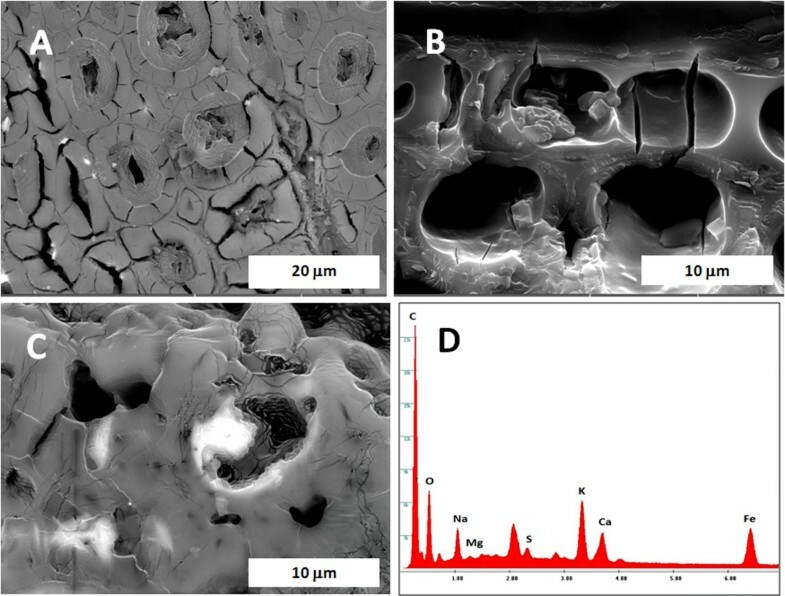 The materials were therefore characterized with X-Ray Fluorescence (EDXRF), Scanning Electron Microscopy with Energy dispersive X-Ray spectroscopy (SEM-EDX) microanalyses and Micro-Infrared Spectroscopy (μFT-IR) techniques. In particular, the metallic elements present in the dyes where revealed through XRF and SEM-EDX, while μFT-IR gave details about organic binders. Elemental compositions obtained for the black decorations allowed to distinguish original parts of the fragments from those restored or remade. The characterization of materials performed by our multi analytical approach, allowed us to get a deep knowledge of the technology of this ancient viol maker. In particular, the varnishes are probably composed by a diterpenic and/or triterpenic resin. In the same way, in a few traces of glue the presence of proteinaceous substances have been individuated. As for the brush-decorated area, they present a preparation layer rich in feldspars on which a black layer of carbon black particles is applied. On the other hand the purfling areas are colored by an iron-gall dye. In particular the usage of a different ink allowed to identify restored areas. The viol, or viola da gamba, was introduced in Italy in the last quarter of the 15th century from Southern Spain . In few decades the viols, made in different sizes corresponding to the different voices of a polyphonic consort, became widespread in Europe . The viol was the string instrument most appreciated among musicians and composers for a long time. The early technical development of the viol is almost contemporary to that of the violin; anyway, with the works of the Amati family, active in Cremona since the first half of the 16th century, the stringed bow instruments soon reached characteristics and shapes very similar to those of the classical and modern ones. In those days, many viol and violin makers were active in Northern Italy and there are significant distinctive features for each local making tradition . Several viols of that period had similar features, which allow to identify a clear making line developed in the area around the city of Bologna during the 16th century. Still existing 16th century viols attributable to this local technique trend have been identified, both in public and private collections, and some of them bear manuscript paper labels glued inside with the signature of the maker Joannes Marcus, or showing stylistic features closely related to him. Despite their differences, the instruments of the viol and of the violin families were made with similar construction techniques and materials. Spruce for the top plate and maple for the other structural parts were the most common wood species; proteinaceous glue, like probably bone or hide glue, were instead used to assemble the instrument; finally, transparent varnishes, composed of natural resins dissolved in alcohol, oil or turpentine spirit, were applied to protect and finish the external surfaces . The top plate of these instruments was always decorated with inlaid multi-layer purflings, made with alternate strips of bright and dark wood to point out the contour of the top and back plates and sometimes also of the ribs. The black purflings were commonly made of naturally dark wood, like ebony, but sometimes other dyed wood species were used to imitate it. Generally, the black dyes have compositions similar to iron-gall ink, based on iron complexes . Sometimes, additional painted decorations can be found on these instruments. In the second half of the 18th century, the instruments of the viol family fell progressively into disuse, finally driven out by the bowed string instruments of the violin family. Nevertheless, many viols were converted, with deep modifications of the structure, in hybrid instruments, with the purpose of a reuse. The bass viol by Joannes Marcus, object of this research, was conserved in Milan, in the musical instrument collection of the Conservatorio G.Verdi. The viol was still intact in 1943, exhibited with other instruments of the collection, but it was completely shattered during World War II when the building was destroyed by an air raid. Just a few fragments were recovered from the ruins and stored in a repository of the Conservatorio’s library, and then forgotten. Many years later they were recovered and identified.The set of remains of the Joannes Marcus bass viol is composed of five fragments (Figure 1): the neck with the upper block, with part of the ribs and of the back plate still joined to it; the scroll, divided from the rest of the neck by a sharp break; part of the back plate broken longitudinally; a narrow strip of wood from the top plate, broken in two parts. The top and back plates and the ribs are decorated with three-layered purflings; the top plate and the neck show a painted decoration: a garland on the outline of the top and a bellflower pattern on the back of the scroll. All the outer surfaces are finished with a clear and brittle varnish; on the inner side of the back plate there is a paper label with the signature of the maker; on the joint between the two longitudinal halves of the top plate there is a reinforce made with a strip of paper from a music score. Many traces and droplets of glue were visible on the surfaces. The remains include also some accessory parts: four pegs painted with the same pattern of the scroll, and a tailpiece. The importance of this research lies in the study of the fragments still not restored of the Joannes Marcus viol through a multi-analytical non destructive approach. In fact, only a few micro-samples were taken in order to characterize the materials, to identify the techniques used by the maker for both the construction and the decorations. The analytical work allowed to verify the hypothesis of old attempts of restoration and modifications of the original structure. The set of remains of Joannes Marcus viol. Fragments of Joannes Marcus bass viol. 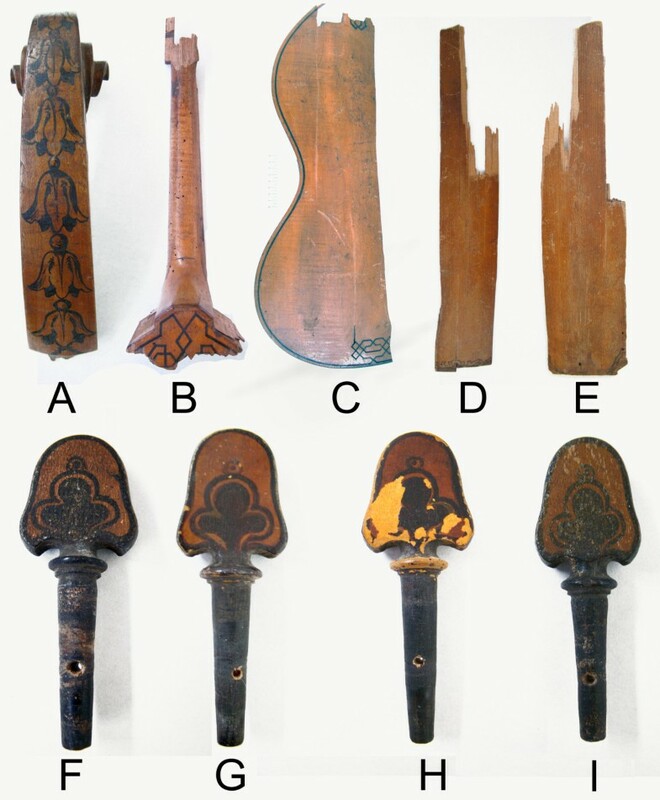 A: decorated scroll; B: neck with the upper block; C: back plate; D and E: top plate fragments; F, G, H and I: tuning pegs. Different imaging (UV-induced fluorescence, IR-reflectography, stereomicroscopy) and analytical techniques (XRF, μFTIR-ATR, optical microscopy, SEM-EDX) were employed to characterize both the materials of the painted decorations and those of the black wood purflings, of the varnishes and of the adhesives. In order to minimize any possible damage to the viol fragments, we decided for our analytical approach to be less invasive as possible. Our intent was to test and develop a procedure which could be also applied on integer instruments. For the same reason, we selected portable instruments, when available, which allow in situ examinations. To individuate and characterize the varnishes, the glue and the possible restored area (ante 1943), investigations by UV fluorescence technique have been carried out. The analytical campaign started with image analyses (namely UV and IR reflectography) in order to obtain an overlook of the materials. Infrared reflectrography measurements have been performed using a CEDIP Jade SWIR near infrared camera (HgCdTe focal plane array, spectral sensitivity 1000 to 2500 nm, 320 × 256 elements). The camera was equipped with a 50 mm macro lens. Samples were analyzed placing the camera at 10 cm distance with a circular illumination of incandescent light. The analysis with UV-induced visible fluorescence was performed by means of preliminary direct observations and then photo shots were taken. The top plate was exposed to a Wood lamp with Philips TL-D 36 W BBL IPP low pressure Hg tubes (emission peak at 360 nm); the photo shooting of visible light fluorescence was carried out using a digital camera Nikon D90 with a Micro Nikkor 85 mm F3.5 objective, using a Kodak Wratten 2E filter (absorption at λ < 415 nm). Non-destructive EDXRF analyses have been performed on the viol fragments with a portable spectrometer (Assing Lithos 3000) equipped with a low power X-ray tube with Mo anode and a Peltier cooled Si-PIN detector. A Zr transmission filter between the X-ray tube and the sample guarantees monochromatic radiation at Mo Kα energy (17.4 keV), with a 4 mm diameter collimator. The irradiated area on the sample is about 25 mm2. This means that for small details such as purflings, the irradiated area is larger that the one of interest. The distance between the sample and the X-ray tube is 1.4 cm; the same applies for the distance between the sample and the detector. The working conditions are 25 kV and 0.3 mA with a 100 s acquisition time. In a second phase, several micro-samples, less than 1 mm2 size, have been collected with a cutter. All the micro-samples have been embedded in epoxy resin EpoFix Struers (curing time 12 hours, 15 parts of resin bisphenol-A-(epichlorhydrin)/2 parts of hardener triethylenetetramine) and then the cross-section observed using a polarized light microscope Olympus BX51TF, equipped with the Olympus TH4-200 lamp (visible light) and the Olympus U-RFL-T (UV light). In order to characterize the organic compounds, on the cross sections and directly on some of the viol fragments μFT-IR analysis has been performed by the Nicolet iN10 Thermo Fischer μFT-IR spectroscope in ATR mode (Ge crystal). The IR spectra were collected in the range between 675 and 4000 cm−1 with a resolution of 4 cm−1, and subsequently expressed in absorbance units. Images at higher magnifications of the samples were obtained through the FE-SEM Tescan Mira 3XMU-series equipped with EDAX spectrometer, at an accelerating voltage of 15–20 kV in high vacuum. The samples were made conductive with a coating of Au deposited with a sputter Cressington 208 HR. The elemental results have been obtained using the EDAX Genesis software processing. This section details the results obtained from the multi-analytical approach (μ-FTIR, SEM-EDS, EDXRF, UV fluorescence and IR reflectography) of the painted decorations, inlaid purfling, varnishes and adhesives. The information obtained by complementary techniques was combined to achieve the most complete knowledge of the materials and of the late renaissance lutherie technology. The preliminary inspection under UV light allowed to identify areas where organic binder materials such as glues and varnishes were used . Figure 2 shows the most important results: in the neck rear are well evident the areas with low fluorescence due to the use and to structural modifications, furthermore, the intense yellow uniform fluorescence due to varnish in the central horizontal area of the neck appears as laid over the black decorations. Finally, on the plate (back side) two different kinds of fluorescence appear together: one, more brilliant and bluish, due to the glue and the other, yellowish, still due to varnish seepage from the front side. Preliminary inspection under UV light. Image of the UV fluorescence of soundboard. Areas that are more brilliant refer to organic polymer compounds. The UV-light induced fluorescence images allowed us to identify some areas of interest for the IR-spectroscopy analysis. In the same way, we pointed out some areas on the junctions and on the neck where the presence of glues was likely. The spectra collected on the varnish (Figure 3A) show absorption bands characteristics of: OH stretching at 3368 cm−1; C-H aliphatic stretching at 2932, 2837 cm−1; C = O broad stretching band absorption centered at 1709 cm−1; C = C double bonds of the vinyl group at 1641 cm−1; C-H absorption at 1451, 1383, 889 cm−1; band characteristic of C-O absorptions at 1249, 1174 cm−1, which intensity is generally linked to an high oxidation level of aged substances; C-C stretching band at 1034 cm−1. These characteristics absorptions could be attributable to aged resinous materials, and, in particular, in accordance with the study of Azémard et al. , to diterpenic and/or triterpenic aged resins [7–9]. IR-spectroscopy analysis performed in ATR mode. A: IR spectrum of the varnish; B: IR spectrum of the decoration. This result is fully compatible with the 16th century historical bibliography. In fact, different historical recipes are known, where diterpenic resin as sandarac and triterpenic resin as mastic were used as main components, generally melted in drying oils or solved, probably as in this case, in alcoholic solutions. 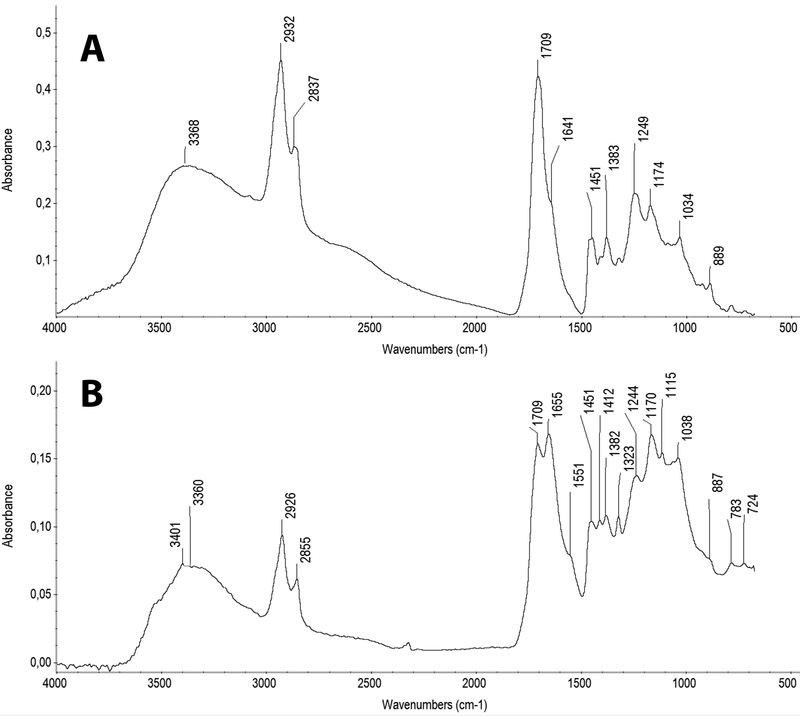 In the same way, traces of glue and samples of it were analyzed: the absorption bands of the spectra collected are characteristic of proteinaceous substances (1650, 1550, 1452 cm−1 Amide I, II, III; FTIR spectrum not shown). According to the wood-working and especially with the violin-making tradition, the use of reversible protein glues has always been very common. Between these ones, animal glues like rabbit glue and hide glue have always been the most widely used. The proteinaceous substance identified by infrared spectroscopy could be probably ascribable to one of these groups. The viol fragments show traces of two different kinds of decorations: brush painted areas, especially present on the scroll and historically made with carbon black or black bone particles dispersed in an organic medium, and purfling inlays, on the upper block of the neck and on the back plate, generally made by black wooden strips colored by iron-gallic dye. In the following section, they will be discussed separately for sake of clarity. Carbon black, if pure, should be deprived of elements detectable by EDXRF analysis; on the contrary, it is very absorbent of infrared radiation so that the infrared image obtained by IR reflectography can make its presence visible. Reflectography is widely used on painting for under-drawing examination. For this reason, there is a deep knowledge of the response of black painting media. We performed long wave infrared reflectography (with sensitivity ranging 1000–2500 nm) because, in this range of wavelength, carbon black pigments are strong absorber while iron-gallic ink are transparent . There are some other materials, such as hematite (iron oxide) which have instead an intermediate behaviour at these wavelengths. The iron-gallic dyes, on the basis of the ancient recipes, were produced by mixing vegetal extracts (tannins obtained by gall-nuts) with inorganic salts (mainly vitriols, nominally iron sulphates with other metal sulphates such manganese, copper, zinc, lead and others). For this reason, this kind of pigments is very well characterized by EDXRF analysis, but it is transparent to IR radiation. The relation between metallic elements and iron, in fact, is the most important parameter for the characterization of iron dye chemical composition . Depending on the origin, the concentrations of the other sulphates listed above, compared with ferrous sulphate, in fact, can vary since the most ancient ingredients were not pure products. Moreover, ratios among the components are not explicitly quoted in ancient recipes and thus the final result can change a lot, the dye being a homemade product. For these reasons, the ratio between iron and other metals is often used to discriminate different iron inks . The samples from the decorations on the back of the scroll were investigated by SEM-EDX analyses in order to highlight the characteristics of the black painting and to study the composition of the materials used; traces of a similar painted decoration are present on the remains of the top plate too. A multilayer structure of the decoration was identified at higher magnification (Figure 4A), with a thin and smooth layer of black color applied over a composite material containing micrometer-sized particles extended on the wood cells, that represents the deepest level of the stratigraphy (Figure 4B). In order to investigate the chemical composition of the materials, EDX and μFTIR analyses were performed. The EDX spectrum of the black color layer only shows the emission peak related to the Carbon, which seems to indicate the presence of a carbon black pigment used for the decoration. However, the EDX analyses were performed also on the ground layer. The spectra show characteristic emission peaks of Mg, K, Ca, Si and Al (Figure 4C). This chemical composition seems to be consistent with the presence of minerals belonging to the group of feldspars, as silicates or aluminum silicates. The weak peak of Fe could be attributable to feldspar impurities and/or to a small quantity of iron oxides or hydroxides . The presence of S could instead be attributable to a small amount of gypsum (CaSO4) 2H2O. Historically, the carbon black was a widespread black pigment used in different artistic techniques. There are different kinds of carbon black ; the only crystalline form of carbon encountered among pigments is graphite. Non-crystalline forms can be classified into flame carbons, cokes and natural coals; quite common forms of carbon black pigment are lamp black (a flame carbon obtained burning oil or resins) and chars obtained from wood (e.g. vine black) or bone materials (e.g. ivory black) . Therefore, the presence of this kind of pigment could be considered compatible with the making and decorative techniques of musical instruments of that period. SEM-EDS investigation. A: SEM images (BSE) of the different layers of the decoration; B: SEM images (BSE) of the ground layer; C: EDX spectrum of the ground, with the characteristic elements emission. The presence of a sort of inorganic ground layer under the carbon black film is remarkable. In fact, there are no historical references on the use of a ground layer under the decorations, in contrast with the varnish of musical instruments, where the presence of an inorganic ground layer is well known, especially during the 17th century, e.g. in many Stradivari’s violins . Following the opinion of many authors, as Sacconi quoted , the surface treatment of many string instruments of the so called classical period of Italian luthery (16th and 17th centuries) is a composite coating with at least two main distinct layers: the outer layer, composed of various varnish coats, is strongly colored and henceforth it can be called color varnish; the inner one is denoted as the ground layer, and is often identified as a hard, durable and insoluble material with good optical properties. According to recent studies and investigations based mainly on SEM-EDX techniques, the principal component of the ground layer of black decorations is a mineral micro- or even nanometric particulate with an organic binder. The μFTIR analyses performed in different points of the decoration show absorption bands characteristic of amino and amide bonds, with stretching of NH at 3401 cm−1, C = O at 1655 cm−1 and NH2 at 1551 cm−1 (Figure 3B). The amino and amide bonds could be related to the presence of a proteinaceous medium of the decoration used as a binder of the carbon black pigment. The other absorption bands, and in particular those at 3360, 2926, 2855, 1709, 1451, 1382, 1170, 1038 and 887 cm−1could be ascribable to the resinous varnish already identified on the fragment surfaces, but could be also attributable to the cellulose of the wooden substrate under the decoration. Anyway, no enough historical information is available about the presence of a ground layer localized under a decoration on musical instruments; moreover, decoration interventions, subsequent to the construction of the viol as well as structural modifications, cannot be excluded.The in situ EDXRF analysis exhibits no peculiar chemical element for the pigment if compared with the not decorated areas, as we expected. Otherwise, this pigment shows strong absorption features both in the visible region of the spectrum (i.e. it appears dark see Figure 5A) and in the near-IR region too, (Figure 5B) so we can affirm that the painted decorations of the scroll and of the sound board have been surely made with a carbon black based pigment. It is interesting to observe that in the EDXRF spectra acquired from many brush decorated areas, there is the presence of characteristic X-ray lines of lead. The scrolls imaging analysis. Visible (A) and NIR (B) image of flowers decoration of the scroll. As for the tuning pegs, a separate discussion it is necessary. Their belonging to the original viol is not sure or documented. The colour of the pegs is yellow ochre and the type of painted decoration is different from the one present on the top of the scroll. For their shape, they can be divided in two groups: the tuning pegs E and F and the ones relative to the G and H.In the visible image (Figure 6) the flower decorations on the four pegs are quite similar while in the NIR images (Figure 7) they show a distinct behavior due to the different opacity of the materials. E and F pegs clearly show the presence of an opaque pigment, like a carbon black based material; moreover, by EDXRF we obtain an elemental composition in the same areas very close to the composition of the scroll decoration, therefore also in this case we can deduce the use of a carbon black pigment. For what concerns the G and H pegs, the pigment in the IR region is semi-transparent but not completely transparent. The EDXRF analysis performed on these samples shows a high content of iron correlated with a peculiar presence of manganese. This NIR semi-transparency could be attributed to the presence of an Iron oxide based mineral as an earth pigment, probably mixed with the iron-gall dye.The stems of the pegs are peculiar and distinctive too: as showed in Figure 8 the E and the F pegs result colored with a carbon black pigment; on the contrary, the other pegs are colored with an iron-gall dye. The EDXRF analysis in fact detects the presence of iron, copper and zinc and the IR reflectography proves a transparency to the NIR radiation characteristic of the iron-gallic dye. The tuning pegs. Visibile image of the E, F, G and H tuning pegs. The tuning pegs NIR images. NIR image of the E, F, G and H tuning pegs. Is evident the different opacity of the material used for the decoration of the flower. The stems of the pegs. Visible and NIR image of the stems of the H and E tuning pegs. The samples of the black purfling from the back plate inlays were investigated by SEM-EDX analyses. At lower magnification, the transverse plane of the sample shows a widespread degradation of the microanatomical wood structures, with the vessel walls cracked in various points (Figure 9A). Furthermore, the vessels appear compressed and show an elliptical shape. At higher magnification, the structure of the cells seems to be vitrified, and the elasticity loss of the wood is remarkable from different deep cracks on the walls of the vessels (Figure 9B). At the same magnification, the wood structures show various white areas all over the wood surfaces, which appear as bright stains with an undefined shape (Figure 9C). The EDX analyses performed on these white areas highlight a high content of Fe, together with the elements usually present (e.g. Na, K, Mg or Ca) in the wood (Figure 9D). This iron concentration is too high if compared with the natural content of wood  and it could be related to the presence of a Fe-complex used to dye the black wood of the purfling. Generally, dyeing the wooden strips of the black purfling was a common practice  and different traditional recipes are known, that used Fe-complex based materials as, e.g., iron-gall ink or also hematoxylin compound (from the heartwood of logwood) . A confirm of this treatment can be inferred from the alteration of the cell shapes pointed out in the SEM morphological study of the wood characteristics: this could be due to a dyeing treatment that included a preliminary dipping in an alkaline solution. The wooden purflings analysis. SEM images (BSE) at different magnifications of wooden purfling samples: A: transverse section; B: vessel structures; C: white stains of the black purfling; D: EDS spectrum of the white stains, with the elemental composition. A final remark has to be done about iron–gallic ink and dye found by the combined use of in situ techniques (namely EDXRF and IR reflectography). The decorative edges are transparent to the IR radiation and the EDXRF analysis detects the presence of iron, copper and nickel (peculiar elements of iron-gall dyes). Taking into account Cu/Fe, and Ni/Fe ratios , we find a correlation except for one point corresponding to a restored area. An analytical campaign on different fragments of a 16th century Viol was performed in order to characterize original materials of this ancient musical instrument. The results highlighted the possibility to get information about ancient materials as varnishes, glues, painted decorations and dyes used to color the inlays. The characterization of materials was performed by a synergic multi analytical approach, and it allowed us to get a deep knowledge of the technology of this ancient viol maker. At first step the analysis under UV light pointed out different visible fluorescence due to both varnish (especially along the less worn out part on the back of the neck) and glue (in the inner edges of the back plate) and allowed us to single out the points where non destructive analysis and microsampling could be performed. The combined use of EDXRF with IR reflectography performed on the inlay of the neck and the back plate detected the presence of an iron-complex dye used to color the black wooden purflings and a carbon black pigment used for the decorations of the scroll and the top plate fragments. These results are confirmed by SEM-EDX analysis that detected lighter elements. The μFTIR analyses were performed on the varnishes layers identified by UV fluorescence imaging and diterpenic and/or triterpenic resinous substances, were individuated. Proteinaceous components in the junctions glues of the fragments were identified by μFTIR analyses: this result could be related to the presence of a bone black pigment or hide glue. Finally the analysis on the tuning pegs highlighted different decoration techniques and helped to confirm the hypothesis about the presence of restoration parts. Letizia Bonizzoni, Claudio Canevari, Anna Galli, Marco Gargano, Nicola Ludwig, Marco Malagodi and Tommaso Rovetta contributed equally to this work. We would like to thank the Conservatorio Giuseppe Verdi in Milan for the collaboration and availability to improve this research, and Prof. Renato Meucci for his cooperation and precious advices. At last, we would like to share the memory of Federico Löwenberger, a great Italian contemporary viol maker. All authors contributed to data analyses and to finalizing the manuscript. All authors have read and approved the final version. All authors read and approved the final manuscript.